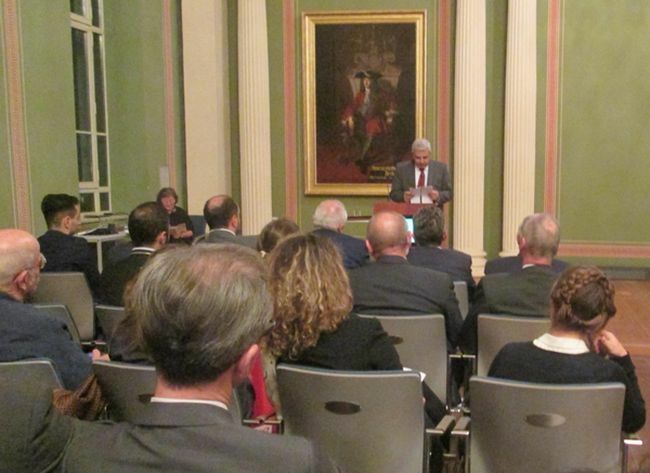 On October 18, at the hall of the University of Halle-Wittenberg after Martin Luther, took place an event dedicated to the 20th anniversary of the establishment of the “Mesrop” Center for Armenian Studies, attended by RA Minister of Education and Science Arayik Harutyunyan, Sachsen-Anhalt State Minister for Education and State Secretary for Culture and the Leadership of Hale University, a number of lecturers, students, representatives of the Armenian community. The Director of Mashtots Matenadaran Vahan Ter-Ghevondian delivered a welcoming speech too. The director of the Matenadaran congratulated the jubilee of the “Mesrop” Center, stressing the great merit of director and professor of the center Armenuhi Drost-Abgarian. V. Ter-Ghevondian noted that “Mesrop” is the only Armenological Chair in Germany and wished it to get the status of a permanent chair. During the event Theo Maarten van Lint (Oxford) said a word of appreciation, Ashot Voskanyan (AUA) made an analytical speech on the political situation in Armenia. The Armenian Ambassador to Germany Ashot Smbatyan also delivered a speech. The following day, on October 19, was held a one-day conference by headline "Germany and Armenia in the sphere of Science, Culture and Education". Twelve distinguished specialists from different branches of Armenian studies from Armenia and Germany (Berlin, Munich, Jena, Halle, and Erlangen-Nuremberg) and Great Britain (Oxford) made presentations. Matenadaran’s Director V. Ter-Ghevondian delivered a speech at the conference entitled "Matenadaran’s Foreign-Language Funds". Presenting the essay, the director of the Matenadaran presented a rich collection of foreign manuscripts and archival documents of Matenadaran. During the event, RA Minister of Education and Science awarded the Director of the “Mesrop” Center with the Ministry's Gold Medal.